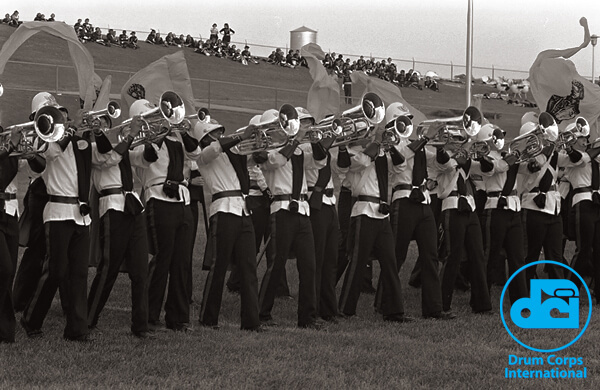 Phantom Regiment members perform during an early-season preview event, June 6, 1978, in Whitewater, Wis. Though never hosting the DCI World Championships again after 1973, Warhawk Stadium in Whitewater remained a popular drum corps venue for many years to come. After this June 6 preview, Phantom Regiment returned to the stadium five weeks later, blasting back from a nine-tenths of a point deficit during the DCI Midwest Prelims, to take first place over the Blue Devils in the Finals. Regiment went on to finish second at the 1978 DCI World Championships in Denver. It'd mark the second time in three straight years (1977-1979) that the corps finished as the silver medalist.